Benefit has just released a new addition to their line of lip and cheek stains. First there was Benetint, the rosy red, then Posietint, the poppy pink. Now there's a warm toned version just in time for summer: ChaCha Tint. 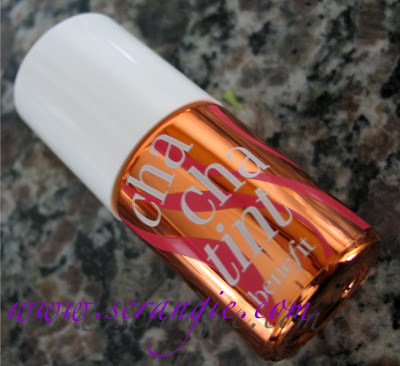 Cha Cha Tint is packaged in an opaque mirrored bottle with a white cap, unlike Benetint which comes in a clear bottle. The bottle contains 0.4 fluid ounces of product. 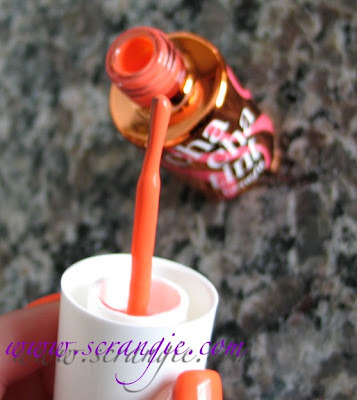 The applicator is a nail-polish style brush wand attached to the cap. The fact that my nail polish is the exact color of Cha Cha Tint is a complete coincidence! 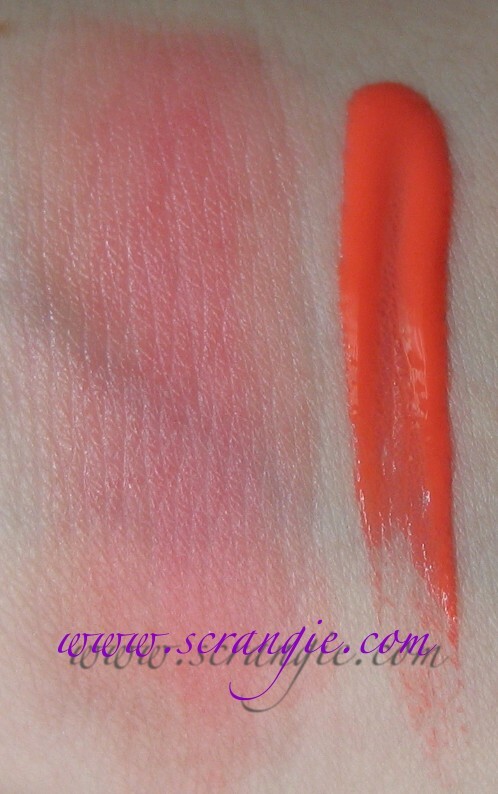 The left swatch is Cha Cha Tint applied heavily and blended with fingertips and the right side is Cha Cha Tint straight from the bottle. 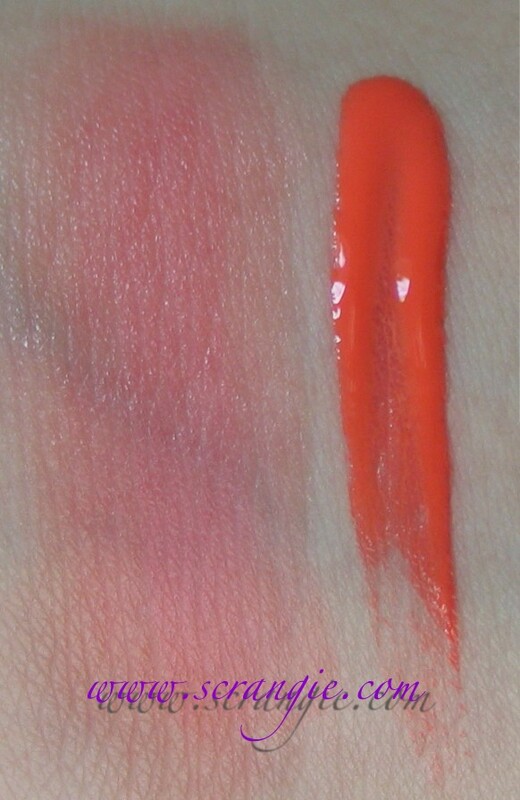 It looks like a scary neon coral straight off the brush, but once it's blended it's a very wearable warm coral pink with orange tones. Benefit describes it as "mango-colored" and I think I can see that... maybe not as yellowy as mango flesh, but it definitely resembles that beautiful blush on the skin of a ripe mango. I took pictures at different angles to show that there is a very subtle dewy sheen once it's blended, but otherwise it's shimmer free. The texture is like a thick liquid. It's not runny and watery, but it's not stiff enough to be a gel. It actually reminds me of full-fat canned coconut milk. Creamy! It has a very light sweet scent that is not noticeable once it's applied. When applied on the lips it has no noticeable flavor besides that slight bitter aftertaste that is common with lip and cheek stains. The wear time is excellent. On cheeks it lasts until you remove it. It doesn't run if you sweat and it doesn't seem to fade. I haven't tried swimming with it, so I don't know if it's waterproof or not. On lips it lasts through everything except eating. It doesn't transfer onto your coffee mug and it doesn't smear, but it doesn't seem to be able to survive lunch. There are a few ways to apply these types of liquid stains. You can swipe the brush directly onto your cheek (or lips) and blend with your fingertips, a sponge or a foundation brush, or you can use your fingertips to gently dab it onto your cheek area and blend it that way. I find it easiest to apply on bare moisturized skin or over tinted moisturizer. There was this old trick I learned back in the day where you draw an arrow with Benetint on the apple of your cheek and then add High Beam as the back half of the arrow along your cheekbone and then blend...With Cha Cha Tint I think that trick might work even better if you replaced the High Beam with Moon Beam to add some gold. Cha Cha Tint is quite bright on my pale, cool-toned skin. I think this warm melon-coral color would look really hot on someone with a deep tan skintone. I always have this image in my mind of a bronze goddess with glowing coral cheeks and lips. This is the perfect shade for tanned, warm-toned skin, especially in the summer. Pale skintones like me can pull it off if we use a lighter hand when applying. 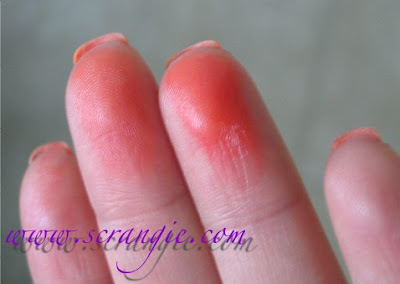 One thing I really like about Cha Cha Tint is that your skin feels really silky and smooth wherever you've applied it. I don't know what it is about the formula, but it makes my skin feel perfect! The name of this has me thinking... You know the old legend about how Benetint was invented, right? Somehow the name "Cha Cha Tint" just makes me think of really odd alternate uses for this product. Heh. Anyway, the reason I'm posting this today instead of Monday is because I've been alerted that HSN is offering a really good deal on this for one day only. Benefit usually does these kits where you get several full sized products and travel sized products for practically the same price as one full-sized item. Today HSN has one of those, the Now to Wow! kit for $33. Cha Cha Tint alone retails for $29. The kit contains a full sized Cha Cha Tint, a full sized BADgal Lash Mascara (which rocks, by the way), a full sized Instant Brow pencil and a mini High Beam. So, obviously, pretty good deal. If I didn't already have all the things in it I'd be buying it for myself, so I thought it would be worth mentioning. Otherwise, this is available at Sephora, Ulta, pretty much everywhere they sell Benefit and it's part of the permanent line. This is absolutely amazing! I'm loving moon beam and i really want this one too! I'm curious about the Benetint legend, too! Darn, I wished I'd read this before the Today's Special on HSN! I caught some of it but never saw Cha Cha swatched. It's really pretty. I've never used Benetint so I didn't know what it was like. I missed a good deal. Very pretty product! I've been venturing more into Benefit cosmetics since I tried the b-right skin care line! This might get picked up!! thanks for the review, I'm in love with this tint!